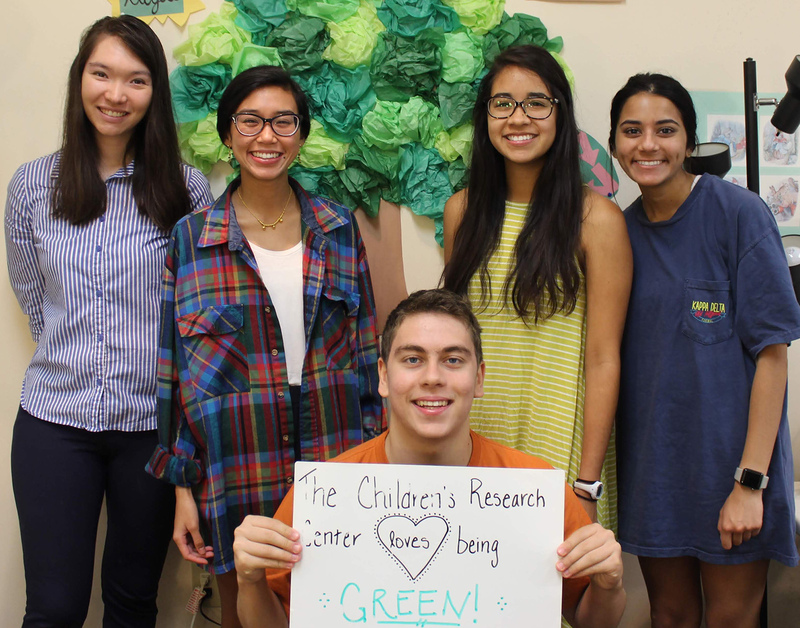 Just two months ago, the Children's Research Center (CRC)—a group of labs that work to understand how children develop and learn at The University of Texas at Austin—officially earned its green stripes by achieving both Green Offices and Green Labs certification. This is the first all-green certification of a center or department on campus. Green Offices and Green Labs are programs administered by student leaders working for the Office of Sustainability. Both programs provide interested units with recommendations for building a more sustainable work environment and improving communication. Units have an array of items to focus on, including greener purchasing, zero waste initiatives, energy reduction methods, alternative transportation for staff, and even health and wellness experiences. During the 2017-18 school year, the push to turn the CRC green came from a champion, a highly energetic and organized outreach coordinator named Avani Chhaya. Chhaya started the ball rolling by reaching out to Susan Ward, leader of the Green Offices program, and Arianna Rodriguez, leader of Green Labs. Both programs have easy-to-follow suggestions and in-person consultations to turn office spaces and labs green. During the 2017-18 school year, the CRC worked with Rodriguez and Ward to certify eight individual research labs as well as certify the Children's Research Center as a Green Offices participant. The results were spectacular: in a few months, all eight CRC labs were certified as exemplary, and CRC achieved Green Office Gold. A number of systems were put in place for this to occur, including the creation of green boards to communicate information, the addition of signage to increase energy conservation, a document of sustainable practices that is now used to onboard new research assistants, the appointment of a health and wellness champion, tracking staff and students using alternative transportation, and a focus on keeping change sustainable through green socials. Even though the CRC has successfully and quickly become more sustainable, Chhaya is not resting. This summer, she is contacting food vendors to ensure that there is less wasteful packaging on food orders, collecting mugs, dishes, and silverware to use in CRC kitchens (instead of plastic or Styrofoam), and thinking about composting in the Seay Building. “These programs were a perfect way to ensure our office and lab spaces were environmentally-sustainable,” says Chhaya. "Additionally, these goals created a cohesive spirit among the different labs. It's been wonderful to be a part of this green program."